Hi friends! Winter is approaching & I’d love to share with you my go-to winter wellness habits that help me feel my best! Keep reading below to learn more! Bath Soak with Epsom Salts! 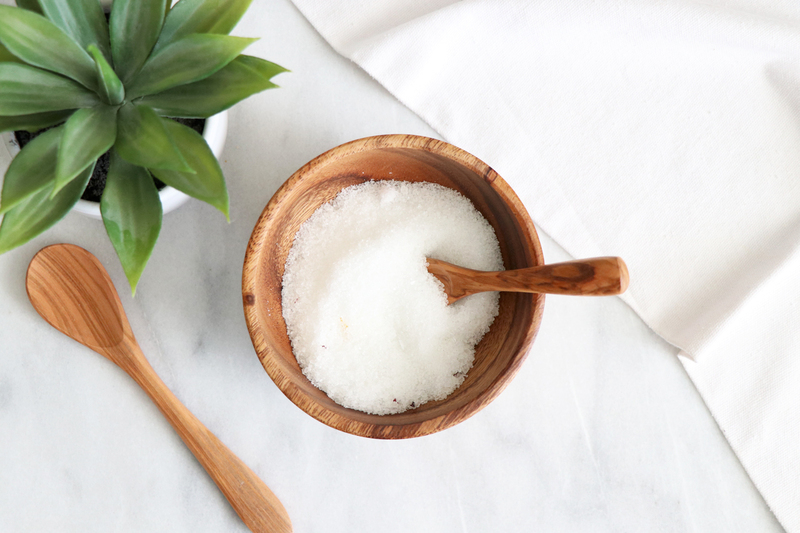 A warm bath with Epsom salts is so comforting, it helps reduce stress & soaking in an Epsom salt bath has been shown to help detoxify the body. I also love to add bath salts that are made with rose petals for a calming aroma, light a candle and play soft spa-like music! A restful night of sleep is so important for our overall health. While we sleep our body works to heal & repair! Sleep can also help regulate appetite, metabolism and overall hormone function. A few tips for a restful night sleep is to make the room as dark as possible (we use black-out curtains) and remove technology from the bedroom (that’s right, no phones in the bedroom!). I also have a diffuser on my nightstand, which I add Lavender essential oils to. The smell of Lavender is very relaxing and puts me right at ease! There are so many delicious foods available to us throughout the Holiday season! I never deprive myself throughout the holidays however I do strive to consume as many real, whole foods as possible. Warm, comfort foods such as soups are a great way to nourish the body & consume a variety of nutrient-dense vegetables and herbs! When you’re feeling worn down, tired & under the weather a big bowl of healthy soup is a must!! Check out the HGG YouTube Channel for easy & delicious soup recipes! 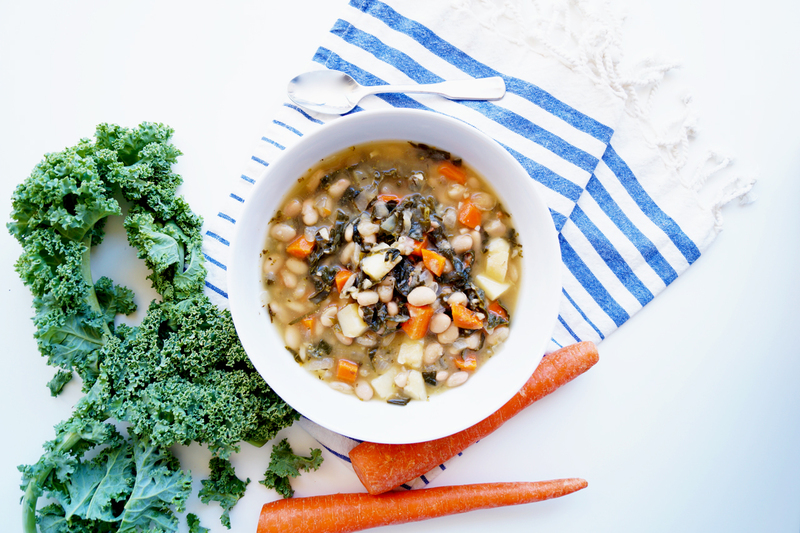 The White Bean & Kale Soup photo below is from our new HGG 7-day Fall Meal Plan! Learn more here! Lots & Lots of Tea! Drinking tea regularly is an easy way to take care of our health this winter! I drink 2 – 3 cups of tea everyday. 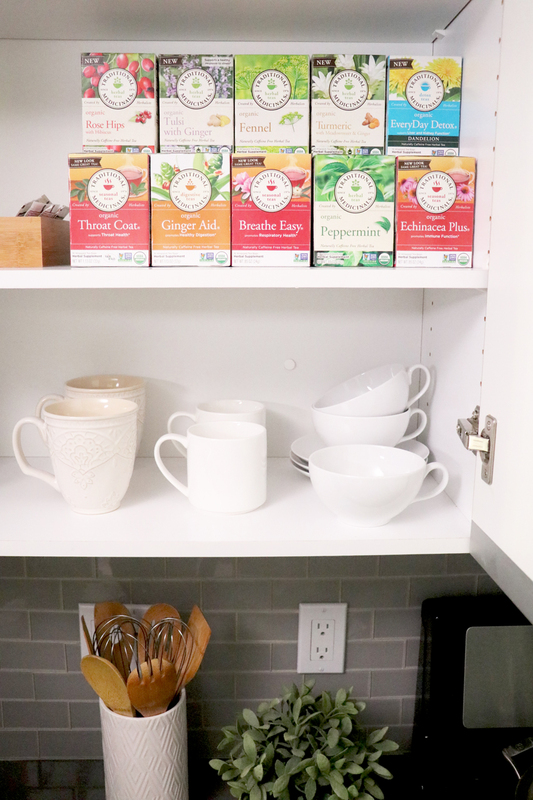 Below is a peak inside my tea cabinet! 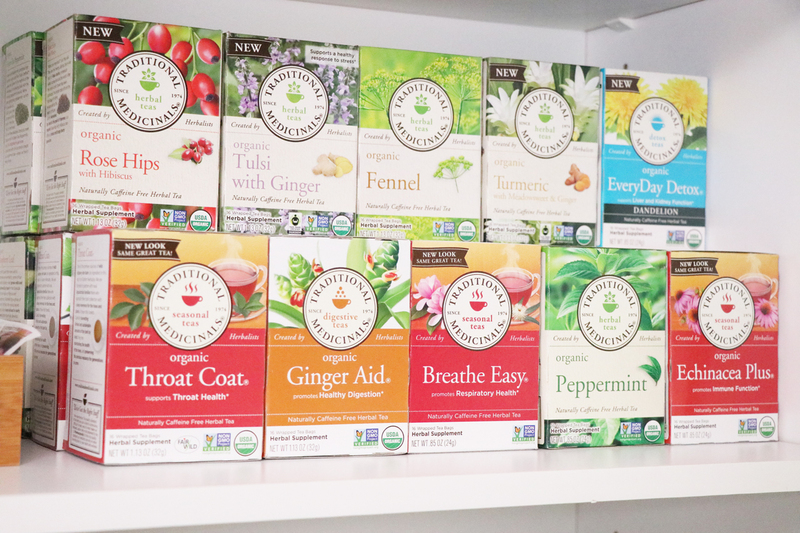 As you can see, I love to keep a steady stock of Traditional Medicinals teas. They have so many wonderful options. Also did you know that not all tea is the same? All food, beverages and supplements can vary in quality & processing! Traditional Medicinals is committed to using pharmacopoeial grade herbs. Basically this means that their herbs are high quality & medicinal grade to deliver their intended health and wellness benefits. They also have rigorous quality control methods to ensure the purity of your tea! I appreciate the efforts they put into making sure my tea is truly just tea, no artificial flavors, bulking agents, grass, fillers and so forth which surprisingly can be found in lower quality teas! Breathe Easy: This tea is a warm and spicy blend that includes organic licorice root, organic eucalyptus leaf, BiYan Pian, organic fennel fruit, organic peppermint leaf, organic calendula flower, pleurisy root and organic ginger rhizome! This tea is designed to promote respiratory health! It’s amazing what an impact the quality of our breathing has on our overall health. 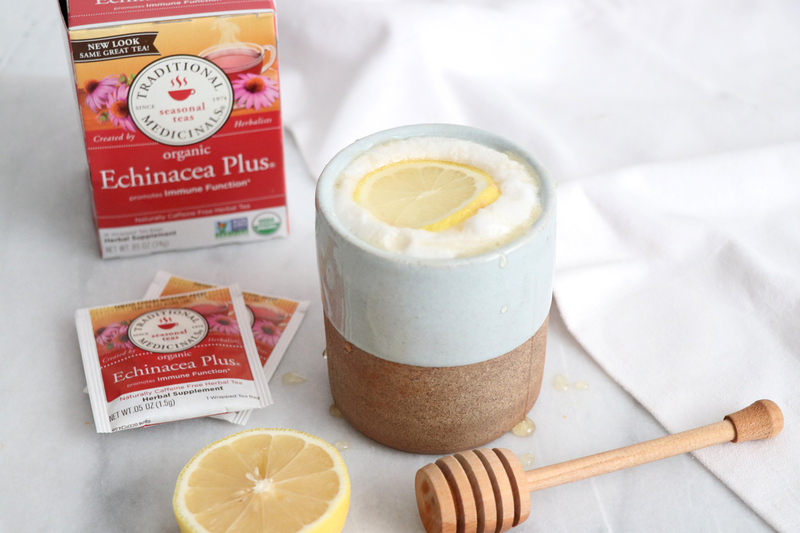 This tea gently shakes things up (think mucus!) and helps you breathe easy. Throat Coat: My job requires that I talk, a lot! Whether I’m in front of the camera for our YouTube videos, videos I host & produce for our wellness clients, being on television or leading our weekly Member Monday videos, I need my voice to be healthy & strong! 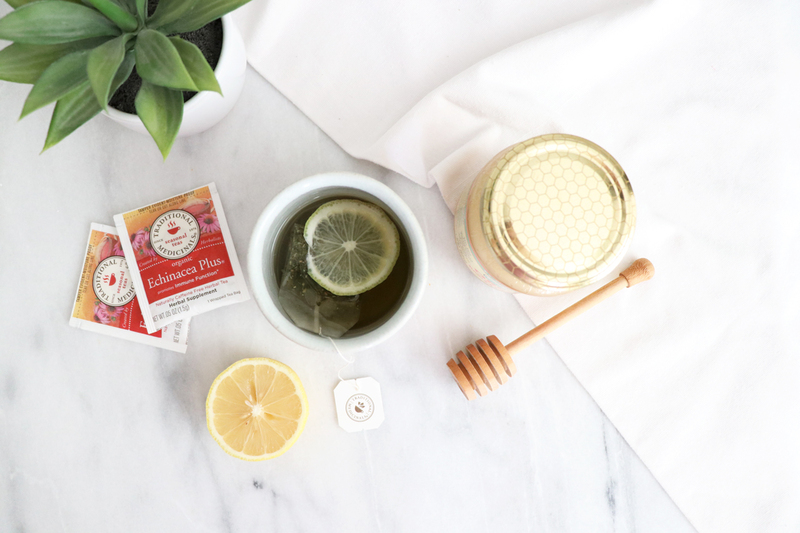 If I notice that my throat needs some help, Throat Coat is my immediate go-to! It is soothing & has a sweet, licorice-like taste. Fennel: Fennel is known for its amazing digestive properties! It has a licorice-like taste & is known to help ease uncomfortable feelings of fullness (for example eating one too many Christmas cookies! ), bloating and gassiness and basically helps promote healthy digestion! 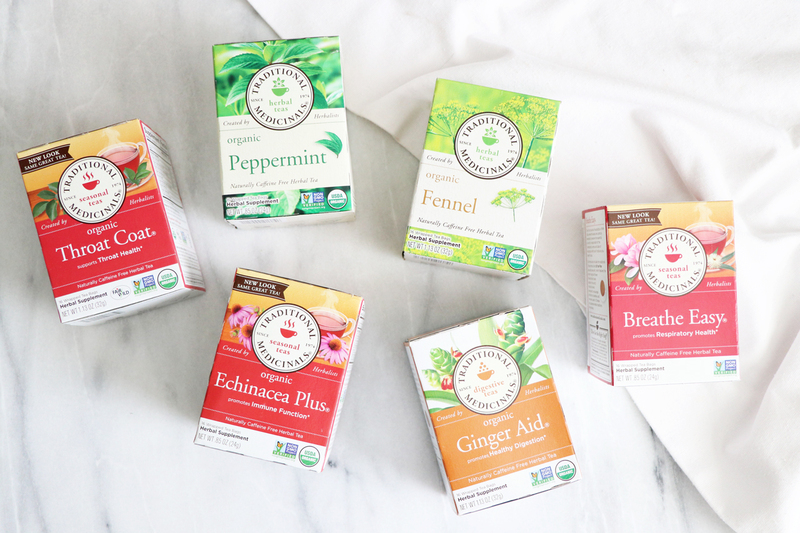 Peppermint: After a big meal, peppermint is my tea of choice! I find that it helps me digest my food & settle an upset stomach. It also tastes great! 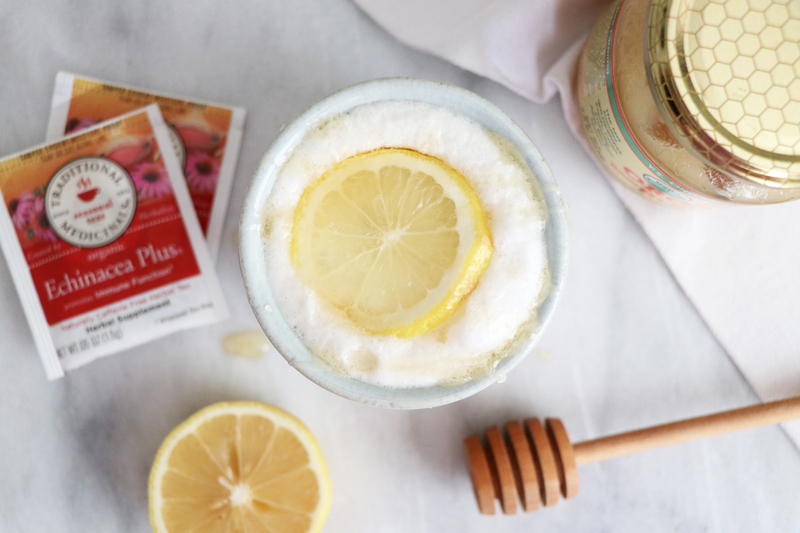 After my tea steeps, I like to add a splash of almond milk which creates a delicious, creamy, peppermint tea! Ginger Aid: We pack Ginger Aid tea with us when we travel whether for work or to visit friends and family over the Holidays. Personally I find that this tea helps settle my stomach. 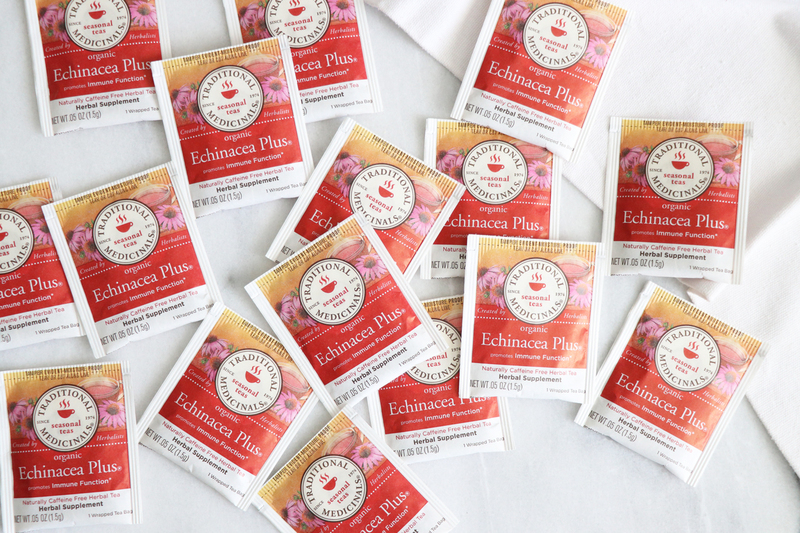 Echinacea Plus: Running my own business… I don’t get sick days! Of course I can always take a day off if I need to, however, when we feel run down it often lasts for days, sometimes weeks! As the “boss-lady” at HGG, I can’t call someone to “fill-in” for me! Being down and out can really throw off our entire work schedule! 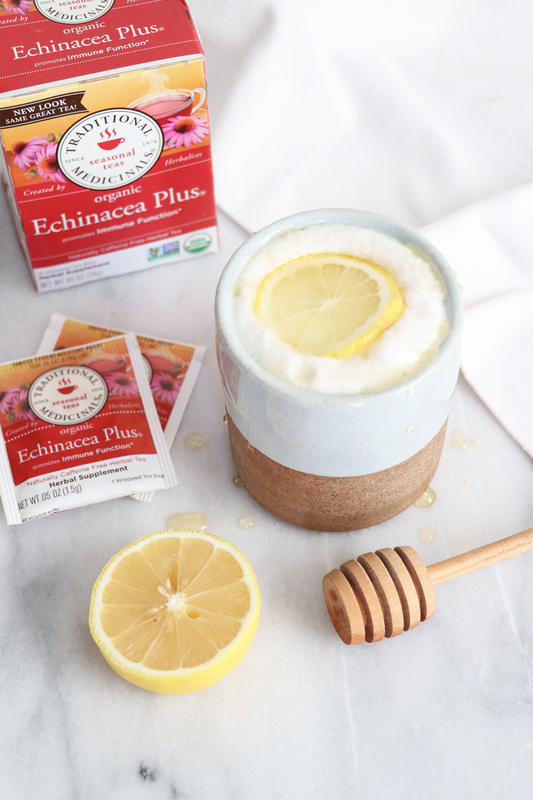 Echinacea Plus is a wonderful tea to drink throughout the winter months because it’s known to promote immune function. A healthy immune system is key for going strong all winter long against everything we are exposed to during the season. In a tea or coffee cup pour 8-ounces of freshly boiled water over 1 tea bag. Cover and let steep for 10 – 15 minutes. Squeeze the tea bag to ensure maximum goodness is in your cup! Then add honey, lemon juice & steamed almond milk. Disclosure: This blog post is sponsored by Traditional Medicinals . All opinions stated are my own. I have been a fan & consumer of Traditional Medicinals tea for many years & I am honored to be a Traditional Medicinals partner. These statements have not been evaluated by the Food and Drug Administration. Products are not intended to diagnose, treat, cure or prevent any disease.